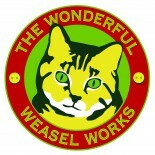 wonderfulweaselworks | Selling recycled and vintage craft materials. Running creative sketch and stitch workshops. Selling recycled and vintage craft materials. Running creative sketch and stitch workshops. Today I have been making little stitched landscapes using beads and lovely sari silks. I am hoping to make some larger pieces later. One of the finished pieces by Sue who joined in with my Ephemera workshop. I love the colours in this one.